Blogs is Watching - A Seattle hip-hop lifestyle blog. (SEATTLE HIP HOP): Shaq set on getting Yao a new set of shoes for his whip! 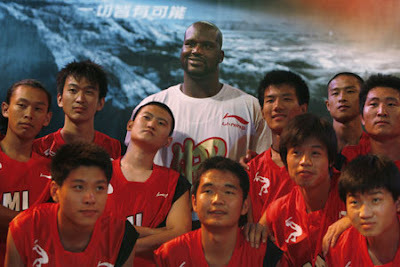 Shaq set on getting Yao a new set of shoes for his whip! Shaquille O'neal comes with the funny. "I would give Yao four 24-inch customized rims at his wedding ceremony." Some reports have claimed the center [Yao Ming] will celebrate another wedding in Houston in autumn, where O'Neal believes he will be among the guests. "I am sure he has sent the invitation to me," he said.